Payday Loan? Cash Advance? No matter what you call it, every Amscot in Tamarac makes getting one convenient. Perhaps you’ve heard the term Payday Loan but have never used the service. At Amscot, we call it a Cash Advance* and for good reason. Here, every approved Cash Advance customer can leave the branch with cash! You could walk out with up to $500 to cover unexpected expenses. Why use an Amscot Cash Advance (Payday Loan) to help you manage your money? Many people in Tamarac find it to be an effective cash management tool. Not only is a Cash Advance fast and convenient, it often costs less than late fees on an overdue bill! We’ve provided some links below for more information. Or, you can simply click the "Get Started" button! Life is busy enough in Tamarac. The least we can do is simplify things. Our fast approval process values your time. We charge some of the lowest Payday Loan fees in the industry. View APR/Fee Schedule. We’re open 365 days a year, and some locations are open 24 hours! Is getting a payday loan a complicated process? Never at Amscot! Our Cash Advance (payday loan) application is short and simple. Once you sign an agreement for your payday loan, you’ll write us a check for the amount plus the fee. Then we’ll give you cash on the spot, holding your check until your next payday when repayment comes due. The good news? Amscot charges a flat, one-time fee, and it’s one of the lowest payday loan fees in the industry. Learn more about Cash Advances / Payday Loans here. A full menu of convenient financial services ... all under one roof! 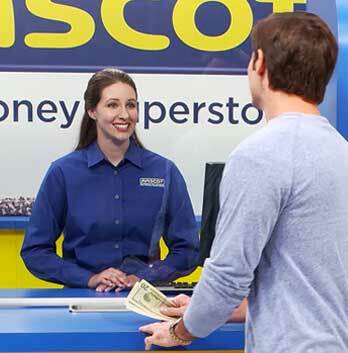 All it takes is one visit to Amscot and you’ll see why we’re called The Money Superstore®. You can cash checks. Pay bills electronically. Wire money. You can get free, unlimited money orders. Send a fax. Make copies. Buy stamps. And use a well-lit, accessible ATM inside the branch. You can even obtain and load an Amscot Prepaid Mastercard. Want to get something notarized? No worries. We staff each location with a full-time notary! Plus, each branch is open 365 days a year, from early in the morning to late at night – and some locations are open 24 hours a day.